We woke up this morning at 8:30. Some of us decided to take advantage of New York’s renowned bagels and made the short walk to grab bagels and shmear before breakfast. At 9:30, we all gathered and took the train down towards Battery Park. At Battery Parkwe looked out and saw Ellis Island, the landmark that represents the turn of the century. We gathered in a circle and talked about immigration. 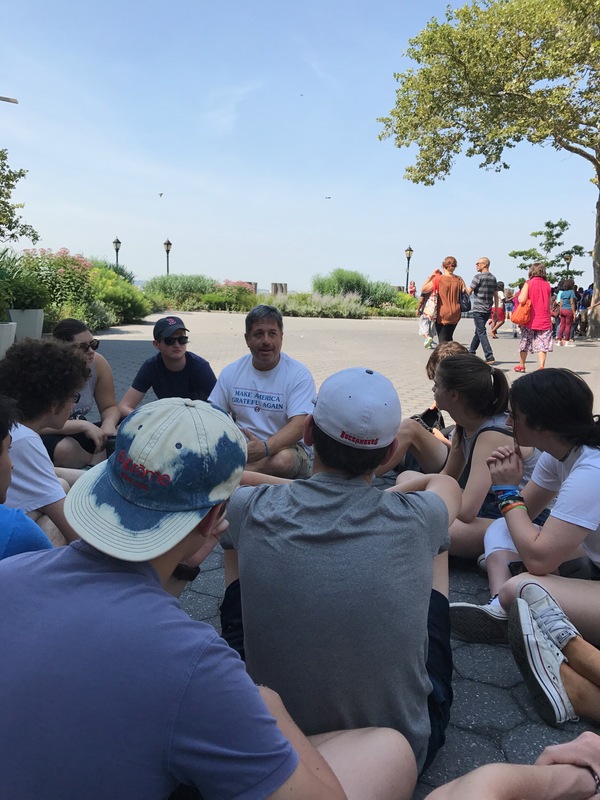 We talked about how Ellis island wasn’t actually the first entry point into the US and that is why we have so many Jews living in the south and in San Antonio. We shared our own stories of where our ancestors came from and how they too likely saw the Statue of Liberty as they entered their new home years ago. It was very moving to be reminded of how we all have similar stories and how we are all connected. We then considered the horrible conditions the likes of our ancestors went through on their over packed boats as they travelled from Europe and how seeing the statue of liberty represented a land of freedom, a land of new possibilities: The American Dream. We shared our own definitions of the American Dream and settled on a definition that the American Dream represents the opportunity to better your life for yourself and for your family. We made it clear that it does not guarantee success but simply provides the opportunity for everyone to reach success if they work hard. We compared our ancestors American dream to today’s American dream and noted that today there isn’t as much equal opportunity to fulfill it. 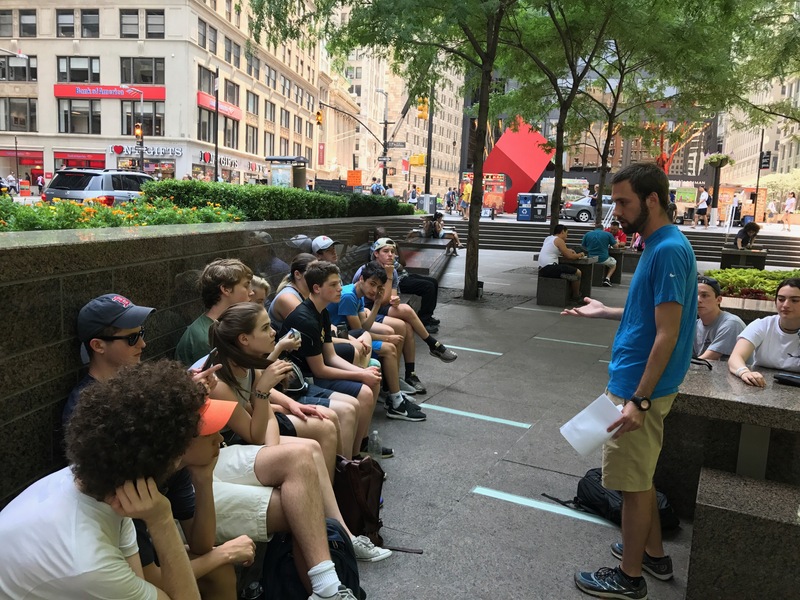 After learning about our ancestors American Dream, we walked towards Wall Street and the New York Stock Exchange, which symbolizes today’s American Dream. We talked about the influence of commerce and how we can make an impact in our own lives by choosing what companies we buy from. When we buy from the likes of Panera and Toms we are supporting social enterprises that give back to the more needy. On the contrary when we buy from companies which don’t have the best workers conditions we are casting a vote with our money for worse working conditions. For me personally, it was fascinating to consider how something as little as buying a Starbuck’s or Panera coffee instead of other ones we can impact the world. Anyhow, it was interesting to be on the street that many consider to be the epitome of fulfilling the modern American dream. We than walked for about 5 minutes to Zucatti Park, the park in which Occupy Wall Street originated from. 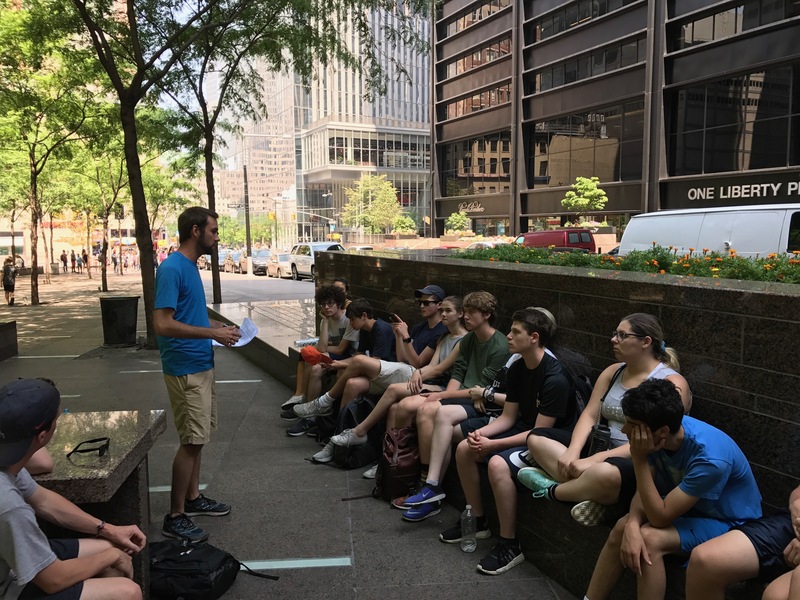 We learned about the Occupy Wall Street Movement and its objectives. First the movement sought to regain the democracy of the people in which they felt was being overshadowed by powers with wealth such as corporations and lobbyists. Their second motive behind the movement was their anger with the recession. Indeed, they felt that people on Wall Street were gambling with their money and they lost it so now the 99% had nothing and those working on Wall Street (the one percent) had it all. We talked about how Occupy was effective because it interfered with executives going to work and made people acknowledge the movement. Most importantly the movement raised awareness talked about the 1% controlling so much of our wealth. After Wall Street, we walked a few more blocks over to the 9/11 memorial, ground zero. We talked about how The World Trade Center was built to show American dominance and strength. The 9/11 memorial was very moving. For me personally I didn’t realize how huge the towers really were. Indeed, the memorial represented the footprints of the actual towers. Also, seeing the list of those killed went on and on and on which made me think about how many people were affected by this tragedy. After the 9/11 memorial, we got to compare Chicago’s Deep Dish Pizza to that of New York’s Pizza. I think that hands down New York wins! 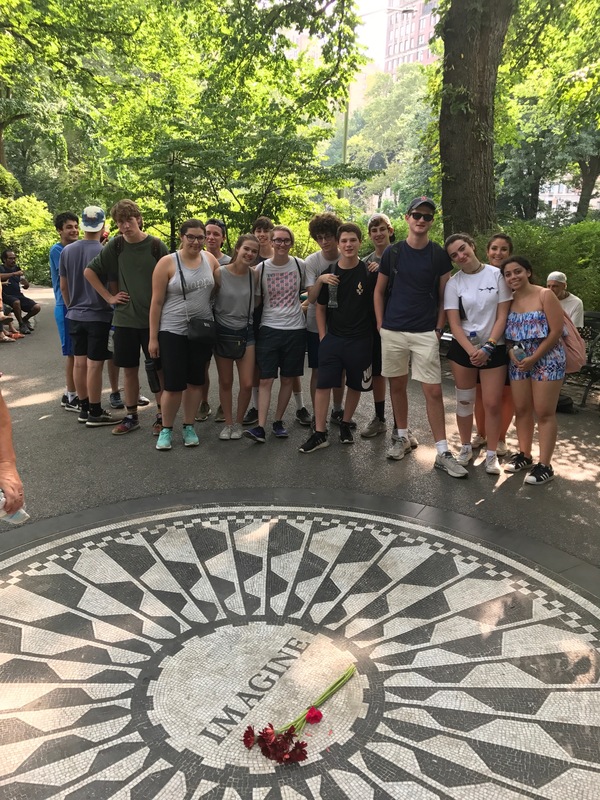 We then went to Central Park where we had a rare opportunity to simply relax and recharge. Most of us simply laid down on the grass and listened to The Guitarman of Central Park. He plays classic rock songs on an acoustic guitar. It was very pretty to be able to sit in such a peaceful park steps away from the most lively city in America. Then we walked through Lower Eastside and then into Chinatown where we smelt an array of different smells (let’s just say some of them weren’t the most appealing). Suddenly, as we crossed streets China Town turned into Little Italy and we had an opportunity to walk around Little Italy and explore the shops. It wouldn’t be a trip to New York if we didn’t have some time for some bargaining so we had some free time to look for souvenirs. Some guy tried to convince me that he was selling me a 1000 dollar Rolex for 5 dollars. Only in New York! We wrapped up the night by having some free time for dinner. Many of us had relatives/friends who we got to catch up with very thought provoking.